Painter Focused on Presence in the Moment of Making. Abstract Acrylic Artwork Using Color to Convey Mood. 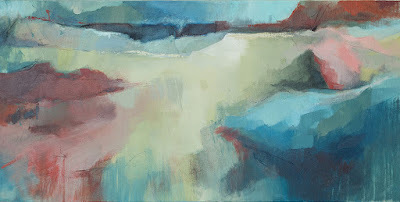 Do you know what I love about Austin artist Ann Flemings? 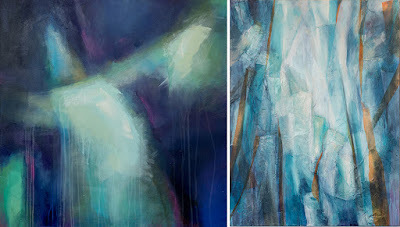 Much like myself, she discovered art at a young age with the encouragement of family, but it wasn't until recent years that she took the opportunity to dedicate herself more fully to her creative side, and the results are fabulous. Ann now shares with us her view of the world through contemporary abstract paintings that come together in a beautiful mix of colors. For Ann, painting offers the chance to be fully present which is really a gift in our era of multi-tasking and constant distractions. This is as true for the artist as the art enjoyer. Ann's process is pretty intuitive as she applies multiple layers of acrylic paint to create a variety of textures and forms. She stops when the composition feels right. While her painted shapes are often loose, she then adds charcoal, pastel or graphic touches to add a big more structure. 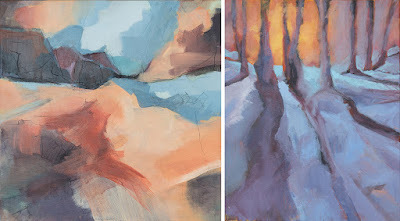 Her pieces invite you to pause and look deeper to explore what they are trying to convey. Often finding inspiration in nature, Ann sometimes models her work into abstract landscapes. At least, that's what I see in a lot of her pieces, but the beauty of successful abstract work is the chance to interpret it in your own way. I am also a big fan of Ann's color palette. 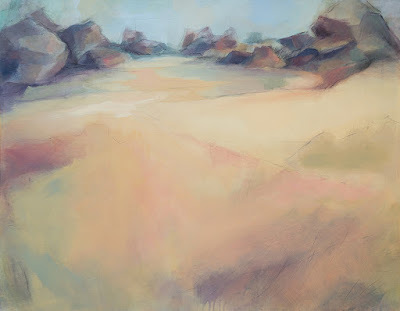 She works in the pastel spectrum for a lot of pieces, and does a lovely job of pairing analogous and complementary colors. Then she sometimes sneaks in a really vibrant hue that pops among the harmony happening on each canvas. In Ann's words, "the best way to experience art is in person," and you can see her work at Austin Artspace.